Alaska Sea kayaking trips in Seward, Alaska 1/2 day to 7-day Small group Alaska kayak tours to Kenai Fjords National Park, Aialik Bay, Bear Glacier, and Resurrection Bay. Backcountry Safaris offer perhaps the most amazing sea kayaking adventures in Alaska. We have sea kayaking trips to fit your available time, budget, and desired comfort level. Experiencing Alaska's calving tidewater glaciers, icebergs, wildlife, and Alaska's wilderness are only part of your Alaska sea kayaking journey. Backcountry Safaris is passionate about what we do and we look forward to teaching you more about Alaska's natural history and culture. And best of all, our Alaska sea kayaking guides will also teach you how to sea kayak, no prior sea kayaking experience is required. Private Custom Trips. If you can imagine it, Backcountry Safaris can make it happen. We offer personalized custom trips that cater to the special interests, dates, and desires of your group or family. A maze of giant icebergs awaits your arrival. Guided trips include comfortable lodging in our modern custom made 12' X 12' WeatherPORTS, a fabric tension shelters featuring wood floors and 2 single beds and heated for your comfort. Includes Anchorage to Seward transportation, pre and post trip lodging in Seward, Alaska and 5-day sea kayaking camping adventure. You'll see why Backcountry Safaris is your best choice. • Dry Suit - We supply dry suits to keep you warm, dry, and help protect you from hypothermia in Alaska's cold waters. Other Seward sea kayaking outfitters provide (or rent at extra cost) rain gear and rubber boots that offer little protection. • Single Kayaks - We provide an option to paddle your own single-person kayak. Other outfitters use only two-person kayaks. • Complete Tour Packages - Sea Kayaking tours that include pre-trip Seward transportation and Alaska lodging. In Seward only Backcountry Safaris offers pre-trip lodging and transportation packages that simplify your travel planning. • Our Most Popular 1 Day Bear Glacier Sea Kayaking Departing From Seward - Bear Glacier is one of the most amazing, photogenic, and unique Alaska sea kayaking experience available in Alaska. • Our Most Popular 2 to 5 Day Bear Glacier Wilderness Retreat Departing From Seward - A maze of giant icebergs awaits your arrival. Sea kayaking around the icebergs is so amazing that when you get here you're going to want to stay longer. 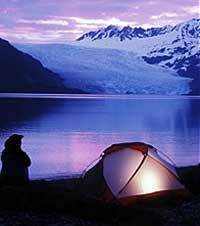 • 3 to 7 Day Kenai Fjords Aialik Bay Sea Kayaking Camping Trips Departing From Seward - Private Trips. Completely outfitted and guided custom private trips. Kenai Fjords National Park's Aialik Bay is one of Alaska's most diverse sea kayaking destinations. There are 3 tidewater glaciers that flow into Aialik Bay, and the area is well known as one of Alaska top wildlife viewing hotspots. • 5 Day Kenai Fjords Aialik Bay Sea Kayaking Camping Trips Departing From Seward - Schedule departure dates. Departing from Seward 5 day Seward sea kayaking camping adventure includes sea kayaking in Kenai Fjords National Park's Aialik Bay, one of Alaska's most diverse sea kayaking destinations. • Our Most Popular 7 Day Kenai Fjords Aialik Bay Sea Kayaking Camping Trip Departing From Anchorage - Schedule departure dates. Aialik Bay Kenai Fjords National Park 7-day sea kayaking camping adventure provides a complete tour package; transportation to and from Seward, pre- and post-trip lodging in Seward, and sea kayaking. • 7 Day Denali Park and Giant Icebergs Tour Departing From Anchorage - This 7 day itinerary is a combination of our 3 Day Denali National Park Adventure and our 3 Day Bear Glacier Wilderness Retreat Sea Kayaking adventure in Kenai Fjords National Park. • 7 Day Bear Viewing and Giant Icebergs Tour Departing From Anchorage - An incredible Alaska tour combination that you won't soon forget. Bear Viewing and Giant Icebergs is a combination of our 3 day bear viewing trip in Lake Clark National Park and our 3 Day Bear Glacier Wilderness Retreat Sea Kayaking adventure in Kenai Fjords National Park. • Bear Glacier Sea Kayaking Do-It-Yourself Package Deal - Includes water taxi to Bear Glacier, camping at Bear Glacier Retreat including a place to set up tents in a electric bear fenced in area. Use of the enclosed sheltered dining area to get out of the elements, and use of a propane stove. Your choice of single and double sea kayak use while at Bear Glacier. • Do-It-Yourself Alaska Sea Kayaking - Guide Rental - Accompanied by one of our highly skilled naturalist sea kayak guides. You save by bringing your own camping gear, food, and by doing your own cooking and camp chores. If needed, Backcountry Safaris can supply the water taxi, kayak and gear rentals. • Water Taxi And Kayak Shuttle - Seward water taxi transportation to any destination in Resurrection Bay, Day Harbor, Bear Glacier, and Kenai Fjords' Aialik Bay and Northwestern Fjords. • Bear Glacier Water Taxi - Bear Glacier water taxi transportation service to Bear Glacier and Bear Glacier Retreat for sea kayakers, campers, hikers and bear hunters. • Bear Glacier Rentals - Single and tandem sea kayaks, dry suits, VHF radios, rubber boots, and dry bags are available at our Bear Glacier Wilderness Retreat camp.